Home / sports news / Is Alisson’s perfect start proof Liverpool have solved their goalkeeper problem? 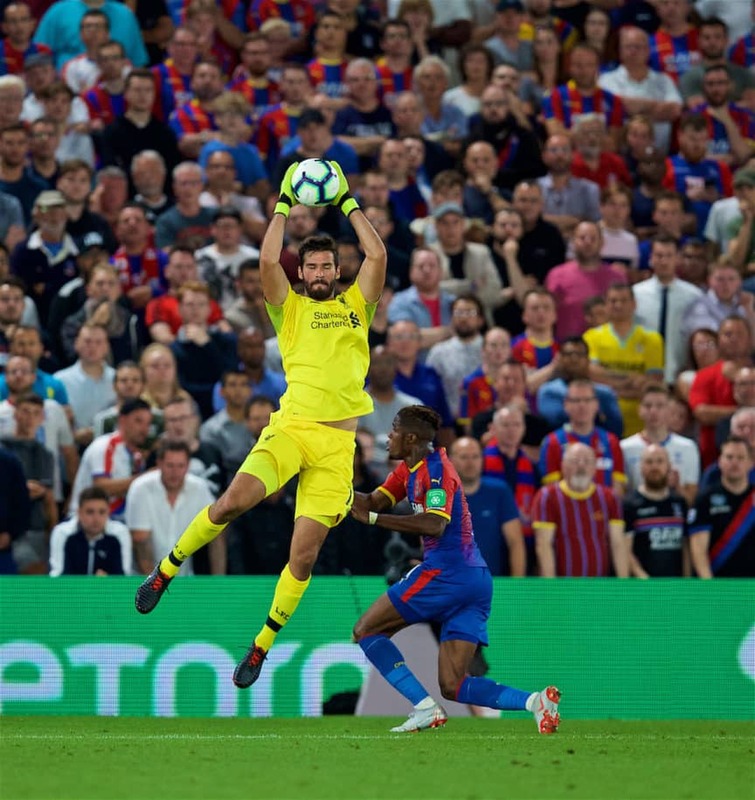 Is Alisson’s perfect start proof Liverpool have solved their goalkeeper problem? Alisson may only be three games into his Liverpool career, but the Brazilian is showing every sign that he is the long-awaited solution between the sticks. It’s taken five years, 305 goals conceded, and a combined 80 million quid, but finally, Liverpool might have a goalkeeper. A proper shot-stopping, area-commanding, cross-collecting keeper of goals. Since Pepe Reina’s premature departure to be reunited with Rafa Benitez at Napoli in the summer of 2013, Liverpool’s goalkeeper situation has been a carousel of calamity, with a succession of slapstick stand-ins causing minor coronaries around the L4 area whenever a ball troubled our six-yard box. Perhaps the Cardiology Ward at Liverpool Royal can now breathe a sigh of relief. It didn’t take a seasoned football expert to notice Liverpool’s shortcomings in this area. For a while, it seemed the only people oblivious to it were those in club’s hierarchy whose job it was to notice. As a fanbase we’d almost resigned ourselves to it. “We’ll just have to outscore them” was a familiar refrain as clean sheets became as uncommon as Everton silverware (OK, not that uncommon). When word crept out last month that Liverpool were preparing a then world-record bid for a goalkeeper, fans would’ve been forgiven for brushing it off as just another baseless rumour, nothing more than Jim White’s wobbly gob spewing forth his biannual stream of fallacious fuckwittery. But it soon became apparent there was substance to the story, and Liverpool made a signing that has the potential to define the course of the next decade. caveat: I know it has only been three games—three early-season, incident-free matches against toothless, mid-table opposition. But these are exactly the types of games that the Reds have contrived to convolute in recent years. And that uncertainty generally emanated from the man between the sticks. On current evidence, there is nothing uncertain about Alisson Ramses Becker. Take last Monday’s game at Selhurst Park as a case in point. Alisson’s clean sheet was earned with minimal fuss—routine saves were made, crosses claimed and victory secured with barely a hair out of place. As daft as it sounds, if all £65 million buys you is the peace of mind that the basics will be done well, I’m sure there aren’t many of us who would complain given what’s gone before. Simon Mignolet had his moments—a debut penalty save, even the odd match-winning performance—but it was mostly false dawns followed by dark nights of dithering and dropped catches. Had a combination of Sergio Ramos’ shoulder and the bright lights of a Champions League final not caused that career-defining catastrophe in Kyiv, we could easily have been looking ahead to another season of Karius as our No. 1. Karius was quietly consistent during the back end of the 2017/18 season, but for the most part he looked like a Kay’s catalogue model who’d got lost after a photo shoot and found himself on the pitch. As for Brad Jones and Adam Bogdan, the less said the better. The statistics cast a slightly more favourable light on Karius than they do on Mignolet. Karius made a total of 49 appearances for the Reds, keeping a clean sheet in 22 of them, roughly 44 percent. Mignolet on the other hand only managed 66 clean sheets in 201 appearances, a clean-sheet percentage of just 33 percent. Mignolet’s figures place him way below that of a number of his predecessors—Jerzy Dudek, Sander Westerveld, and perhaps most damningly of all, David ‘Calamity’ James. In fact, you have to go back as far as the late-1940s before you find a comparative record, that of Welsh stopper Cyril Sidlow, whose return of 54 clean sheets in 164 games is ever so slightly worse than Mignolet’s at 32 percent. I’m sure Sidlow’s 1946/47 League Championship winners’ medal softened the blow. To be fair, Alisson’s career clean-sheet record currently sits at an unremarkable 40 percent, and the introduction of Virgil Van Dijk to an increasingly well-drilled Liverpool side undoubtedly gives any current ‘keeper an advantage. Goalkeepers don’t concede goals in isolation, after all. But it is another of the Brazilian’s attributes which might be most important to Liverpool and their style of play: his distribution. In the short 270 minutes he’s been a Red, Alisson has completed over 90 percent of the passes he’s attempted. Against Palace he operated as the deepest of deep-lying playmakers, spraying the ball around like a gloved Xabi Alonso. During Saturday’s 1-0 win over Brighton he decided that wasn’t enough and decide he wanted to end careers with outrageous skill too (rest in peace, Anthony Knockaert). Alisson’s ability with the ball is second to none, and as this superb Twitter thread illustrates, the Brazilian is particularly adept when it comes to mid-to-long range passes. As James Nalton pointed out here last week, Alisson completed 19 out of 23 long balls he attempted at Selhurst Park, many of which intelligently exploited the space on Palace’s flanks to set us off on promising counter attacks. With pace on the counter one of this Liverpool side’s defining characteristics, it wouldn’t be a surprise if Alisson is directly involved in one or two goals at the opposite end of the pitch this season, with defence becoming the first line of attack. Part of me feels a degree of sympathy for opposing managers. Until recently the old Sunday league adage of “test the ‘keeper early” might have been a valid tactical instruction. Not any more. Get it up to the big man? Sure. Go for it. Our big man is bigger. Get it in the mixer from set-pieces? Go ‘ead. But we’ll probably be in your 18-yard box before you know it. 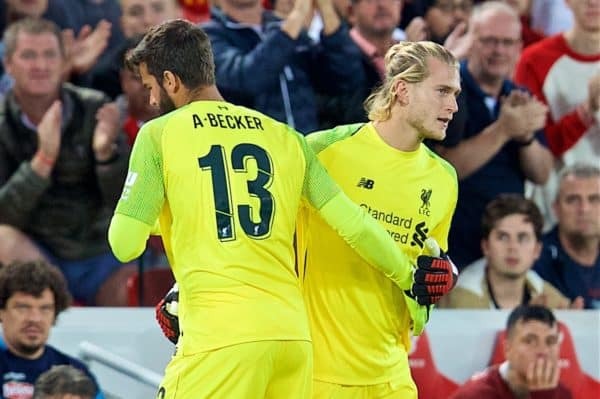 Liverpool will face sterner opposition than we have in the opening weeks of the season, and Alisson’s resolve no doubt will be put to the test. But early signs suggest there is cause for optimism, maybe even relaxation, and one more reason to believe this Liverpool side is the real deal.